Day 1: Arrive to ChengDu. Airport pickup and transfer to city for some sight-seeing in mini-van (depends on time available). In the evening, we will send you to ChengDu train station for your departure to Tibet (train departs 2036hrs). Overnight on train. Day 2: QingHai - Tibet train. En-route to Tibet on train. 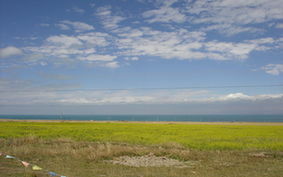 Enjoy the scenery of the QingHai-Tibetan plateau. As it is a 44-hour train journey, we recommend you to bring some books and music with you. Overnight on train. Day 3: Arrive Lhasa Tibet. You should enter the QingHai plateau. Please use the above altitude map as a guide to your location along the route. After almost 48 hrs on the train, you will arrive in Tibet. We will welcome you at train station and transfer to hotel. Welcome dinner in Lhasa (hotel). Day 4: Lhasa – acclimatisation. Acclimatise to 3650 m. you can do short walks around Barkor square and Jokhang Palace (hotel). Day 5: Lhasa – acclimatisation. Visit to Potala Palace and Jokhang Palace. Check out Bharkor Square (hotel). Day 6: Lhasa - Gyantse (drive 259 km). Enjoy the scenery of Tibet en-route and visit Yamdrok Yumtso Lake. After lunch, continue drive to Gyantse to see Old Fort ruins and Palchoi Monastery (hotel). we will rest for the night in Lhatse to prepare for the drive into Everest base camp (hotel). Rongbuk Monastery, take a horse-cart up to the base camp. Do not forget the sunset! Overnight in Everest base camp tents. Day 9: Mount Everest Base Camp - Shigatse (drive 353 km). Wake up to view the sunlight shinning on the top of the world’s highest peak. Everest base camp/Rongbuk drive to Shigatse (hotel). Day 10: Shigatse - Lhasa (drive 270 km). Overnight at the hotel. Day 11: Lhasa - Namtso Lake - Lhasa. Drive up 230 km north to see Namtso Lake, the highest saltwater lake in the world at 4718 m. You have time to complete a 1-round hike around the island and take on the steps to the top of the hill after lunch before driving back to Lhasa (hotel).